The AVR-5B, AVR-7B, and AVR-8A series of pulse generators are fast, high-voltage pulse generators capable of driving load impedances of 50Ω and higher. Model AVR-5B-B provides up to 500V out (to 50Ω) with rise times of 30 ns and pulse widths variable from 100 ns to 100 us. The pulse repetition frequency (or “PRF”) is variable from 1 Hz to 10 kHz. This model will provide peak output power of 5000 Watts and average outputs of 50 Watts (i.e. 1% maximum duty cycle). The output stages in all models will safely withstand any combination of front panel control settings, output open or short circuits, and high-duty cycles. An internal power supply monitor removes the power to the output stage for five seconds if an average power overload exists. Aside from the internal clock, all models can also be triggered by a single-pulse pushbutton or an external TTL-level trigger input. When triggered externally, the output pulse width can be set to track the input trigger pulse width (PWOUT = PWIN). A delay control and a sync output are provided for oscilloscope triggering. A gate input is also provided. A burst mode option is also available. Either output polarity can be provided, as well as a dual output polarity option. All models include a computer control interface. This provides GPIB and RS-232 computer-control, as well as front panel keypad and adjust knob control of the output pulse parameters. 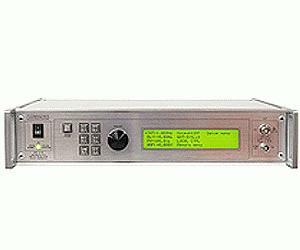 A large back-lit LCD displays the output amplitude, polarity, frequency, pulse width, and delay. All models are available with optional electronic analog control of the amplitude. The standard output connectors may optionally be changed from N (on the AVR-5 and AVR-7 series) or SHV (AVR-8) to SHV, MHV or HN by adding “-SHV”, “-MHV”, or “-HN” to the model number. All models require 100 - 240 V, 50 - 60 Hz, and are mounted in a rugged all-metal 3.9” x 17” x 14.8” chassis.